For a big video game franchise, Persona has had barely any presence in mobile gaming world in terms of official apps or smartphone games. Because of this, I was surprised to hear that Persona was getting its own smartphone app and mini-game called Persona O.A. featuring new dialogue with everyone’s favourite Persona 5 characters and gameplay elements from Persona 5. Persona O.A. is out now in Japan in an initial form but it’s supposed to get updated with the gameplay features sometime in the future, so I thought I’d talk about what Persona O.A. is now and what it’s supposed to be in its Japanese version with the hope that one day it will be released in the West as well. Persona O.A. is described as a “Persona support app” and in its eventual form is supposed to be part news app with it giving updates on the Persona series and also part smartphone game, with it being possible to get Personas using Persona Points and to take part in dungeons with Persona 5’s main cast as partners. 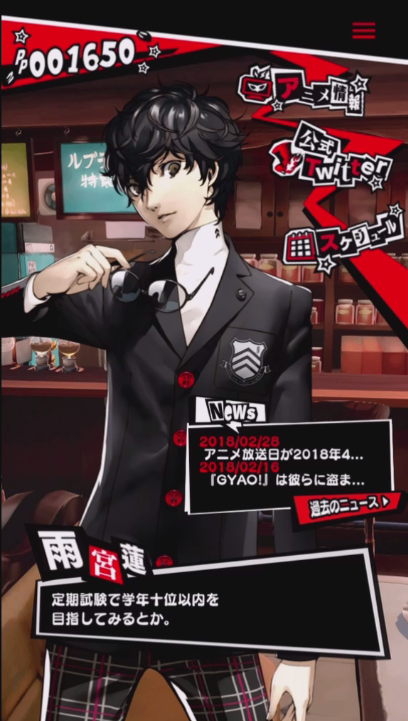 Persona Points are the main currency in the app and there a few things fans of Persona 5 maybe very interested in using them on, including what looks like over 100 new conversations with Persona 5 characters that will feature brand new dialogue, which would be a cool element to have in pocket form if the latest Abema TV preview is anything to go off. 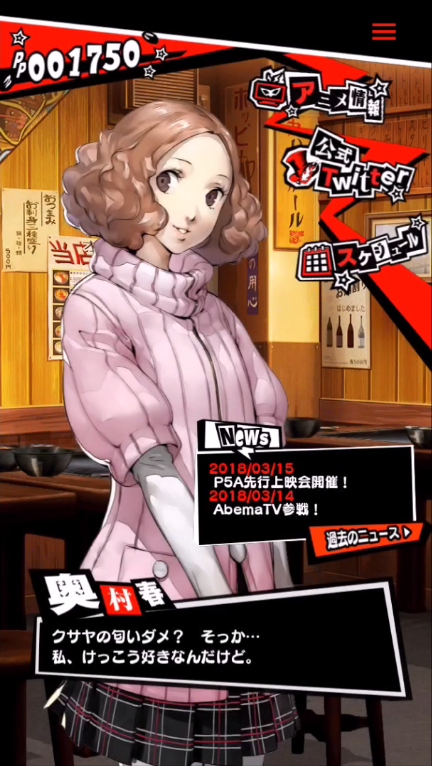 The Abema TV preview also showed off some of the summoning mechanics that feature in a Persona gacha system of sorts, with the menu also suggesting you can give them skills as well that would likely tie into its dungeon exploring mechanic where you can visit the familiar Mementos in a condensed form. This dungeon crawling was described as a “search game” in the Abema TV preview that seems less active than its turn-based JRPG battles and will be used to get prizes and more points while leveling up Persona 5 characters. While it’s not going to be as intricate as the console version, if all of these things are included in future updates to Persona O.A., it looks like a smartphone app I’d personally be interested in as a Persona fan as it looks like a version that is both condensed and yet full of content to satisfy a Persona craving on the go. Since Persona 5 didn’t feature any additional story in DLC and is a console experience, this would be a great way to spend more time with its characters in a portable setting and I’m curious to see if it will tell its own story or expand on moments in the original Persona 5 game. In its current form, Persona O.A. is more of a news app than game at the moment, with most of its news features in tact and the gameplay features promised nowhere to be found as of yet. It does say on the Persona O.A. website they will be coming in a future version, so at the very least the current version of the app allows a little peek of what’s to come, with its Persona Points system already being in place giving an opportunity to collect some points from daily rewards to use when the full experience becomes implemented. At the moment, the main features are the ones that help users keep up to date with Persona news and events. 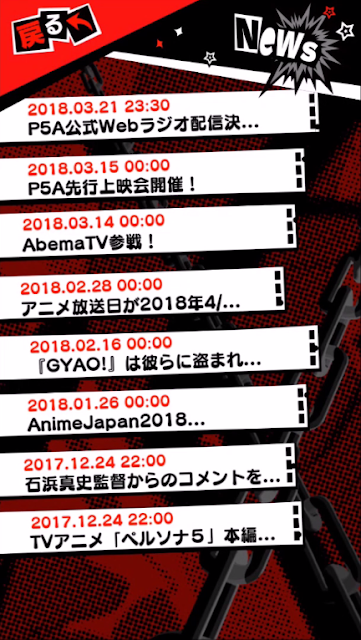 There’s a Persona 5-style calendar in place that lists upcoming Persona events such as the upcoming Persona 5 Animation and you can currently use Persona points to access exclusive events in Japan and download smartphone wallpapers. For me, these weren’t the features that drew me to download the app, but I’m sure it’ll be a nice bonus to instantly have access to Persona information when it adds its gameplay elements. The biggest draw to downloading the current version of the app for me is the little pop-ups of Persona characters with new lines as you go back to its home screen, which currently are only in Japanese but really show the character’s personalities. Things like Akechi talking about sushi or Futaba talking about computers is a cute thing to open up the app to and seeing them in familiar locations from Persona 5 made me nostalgic for the fun times I had with the characters in the console version of Persona. These moments are just one-liners right now, but if the added conversations have the same kind of charm, I think they’re something to look forward to for those interested in trying this experience. Whether or not this app will get localised hasn’t really been touched on yet, but regardless I look forward to trying the gameplay elements when they’re added and I sincerely hope that if they’re fun enough and Western audiences are interested, they’ll consider localising this app that looks to be a fun condensed version of a fantastic console JRPG. Are you interested in Persona O.A.? Would you try it if it came out in English?